It’s a new way of connecting steel members. Without bolts. Without welds. Fewer elements in the construction process. The connections don’t need any bolts or welds, rapidly increasing erection times. Reduced time on site means lower labour and equipment hire costs. through reduced connection labour, and less human involvement in construction. The connection components are made to exacting tolerances, then cater for normal fabrication tolerances so pieces fit together perfectly. Manufacturing techniques have progressed and it is now possible to print steel components. This means we can now print spigots and sockets that fit together with minimal clearance, and weld these to conventional columns and beams. So this technology makes the altCONNECT structure a possibility. Most structures are subjected to vertical forces due to gravity – self-weight, weight of equipment, and “live” loads – those that come and go. These forces transfer to columns and produce compression. and produce bending in beams and columns along with tension (uplift) and compression. altCONNECT requires “frame sway” to work, so we don’t need or even want bracing. The sway produces bending in the connection, and the friction this causes stops the connection from coming apart. If there’s no bending, then there’s no uplift. There are numerous possibilities for altCONNECT structures in mining and petroleum plants where on-site costs are huge, but there are also huge possibilities for multi-storey commercial and residential buildings too. How much does the connection cost compared with conventional connections? Because the connection is manufactured using 3D printing, the material is superior in strength and will be more expensive than equivalent conventional mild steel connections. The cost savings are in the reduced installation time on site. How is the connection analysed? The connection is analysed using Finite Element Analysis (FEA) to correctly model the friction between all surface areas in contact under specific load combinations. 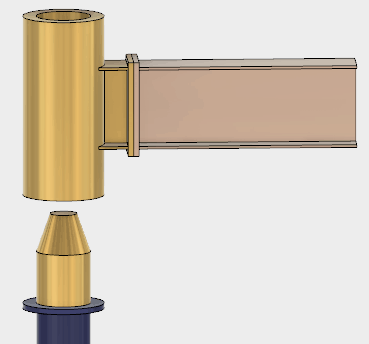 Safe load tables will be prepared for standard connection components allowing the use of convential analysis software such as Microstran and Space Gass. Can the connection be used in a braced structure? Initially, no. A sway frame produces the bending moments necessary for the connection to engage and resist tension. However, we expect the presence of bracing elements will not cause the separation of the connection and will be carrying out tests to confirm this. How fine a tolerance is required on the spigot connection? Tolerances will depend on the amount of “take-up” that can be tolerated by the complete structure under serviceability loads, and the positional accuracy of fabricated members. Typically the gap between the socket and the spigot will be less than 1 mm. Do spigots need to be seal welded after installation to prevent corrosion in the joint? No. There are several ways the connection can be configured to prevent the ingress of moisture and dust without needing access to the connection after assembly. How difficult would it be to paint inside the spigot? It is not intended that the spigot or socket are painted. Is altCONNECT only suitable for small 4-column structures? No, the connections can be used throughout a large multi-level, multi-column structure. altCONNECT connections can be used on beams as well as columns, allowing large platform arrangements to be assembled on the ground and lifted into position. What if the connection is contaminated with oil or other lubricating substance prior to installation? It’s important to maintain the surfaces of the spigot and socket. In the event that these are contaminated prior to installation, they would be fully cleaned and prepared in accordance with the installation procedure. Can this system be retro-fitted to existing structures viably and timely? An existing structure can be extended using the altCONNECT system, however the connection requires a minimum bending moment so an engineering analysis of the whole structure would likely be necessary to determine the design actions in the connections and the change in design actions in existing members and connections. Over time, will movement caused by wind result in failure of the connection? Movement of the structure is not desirable and so it is intended that the structure doesn’t move any more than a conventionally connected moment-resisting sway frame structure. Do the connections have a life expectancy for structures that have vibrating/rotating equipment that may cause excessive wear in the friction joint? All connections subject to load reversal have a fatigue life. altCONNECT stresses are compression only, so when a load reversal occurs a different portion of the connection compresses. Consequently, the stress range is half of that experienced in a conventional connection. The wear of the connection under load reversal is yet to be determined and will be thoroughly examined during testing. How does an altCONNECT structure cope with vibration from equipment such as screens, feeders etc given a lack of bracing? First up the choice of a sway frame over a braced frame has little to do with altCONNECT. If it is necessary for a structure to be fully braced and hence as stiff as possible then altCONNECT is not a likely choice. However, several vibrating structures can benefit from being moment-resisting sway frames, and in this case, altCONNECT connections shouldn’t be ruled out. The fatigue performance of an altCONNECT structure is yet to be determined and will be thoroughly examined during testing. What if additional bracing is added to the structure? Would that compromise the effectiveness of the joint? There are several examples in the mining industry where structures are modified without consulting the design engineer. This is always potentially disastrous and not acceptable according to the NCC and State mining acts and regulations. A structure modification must be validated by a competent person. altCONNECT adds a bit of complexity to the analysis but no more than seismic provisions for example. Bracing reduces the bending moment in the connection and could potentially result in the connection lifting under uplift forces.